climate change will worsen the problem of water logging and flooding in Kochi city, Kerala. As per a study, Possible Vulnerabilities of Cochin, India, to Climate Change Impacts and Response Strategies to increase Resilience, the mean annual temperature of Kochi has increased by 1c over the past 50 years. If the present rate of increase continues, the sea surface off the Cochin coast will become warmer by 0.5c till the end of 2050. This is alarming, as sea surface temperature also influences the climate of the city, which is Kerala's business capital. This study, conducted by Cochin University of Science and Technology (cusat) in collaboration with the Oak Ridge National Laboratory (ornl), recommends canal restoration as one of the best ways out. 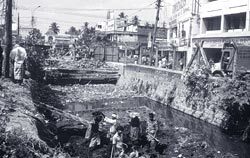 The canal system -- the lifeline of the city -- has got clogged in several places due to uncontrolled development and reckless disposal of waste. The city generates around 350-400 metric tonnes of solid waste every day and about 40-50 per cent of this is dumped in the canals and drains. The city's drainage system is also in a pathetic state. "Almost every activity of the city is affected by water. Unless action is taken to make the water and waste disposal systems effective, global warming will significantly increase the city's problems," says C K Rajan, who led the cusat team. The major impacts of climate change -- sea level rise and more severe precipitation -- will increase the availability of ground and surface water. Without an efficient drainage system, this might increase the number of waterlogged areas. The study has identified 15 areas of the city centre that have become prone to water logging during the past several years. According to the researchers, the combination of water stagnation, waste accumulation and warmer temperatures will encourage the breeding of mosquitoes, flies and rodents, which could transmit diseases to humans. In waterlogged areas, pollutants leached by waste will even contaminate groundwater sources. The us Agency for Development (usaid), which played a crucial role in conducting the study, has offered funds and technological assistance to launch projects aimed at mitigating the impacts of climate change. The top priority is the canal restoration scheme. However, the Cochin Corporation is yet to take any decision about the projects.